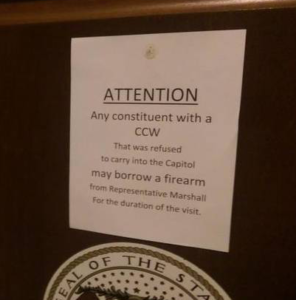 Signs have been posted at some Missouri Capitol entrances stating concealed carry permit holders can now bring guns inside, but firearms are prohibited in legislative chambers and hearing rooms. 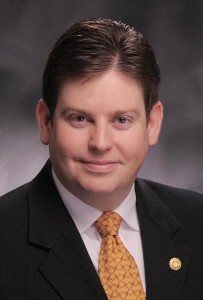 State Rep. Nick Marshall (R-Parkville) is pleased with the change, but thinks citizens should also be able to take guns into those areas currently restricted. Marshall wants to change state law to go a step further and also allow guns in the chambers and hearing rooms. He plans to file a bill to address that issue in the coming days. “To say that ‘oh yeah you can have your firearm and you can be safe out in public but you can’t be safe when you come around us.’ Come on,” says Marshall. Metal detectors were added at some Capitol entrances last month, prompting Marshall to offer his gun to those citizens while visiting the Capitol. Under the latest change, he won’t go as far as letting them drop their guns off in his office. “I don’t think that that’s really what my place is, as a state Representative, to be a safekeeping place for everybody’s firearm,” says Marshall. Marshall says those taking guns into the Capitol’s chambers and meeting places can’t be charged with a crime. They will simply be asked to leave. To view the Capitol security policy regarding firearms, click here.